One of the rare days we have backtracked on the tour and I think the first time we have done the same day in reverse. There are two good reasons for doing it. 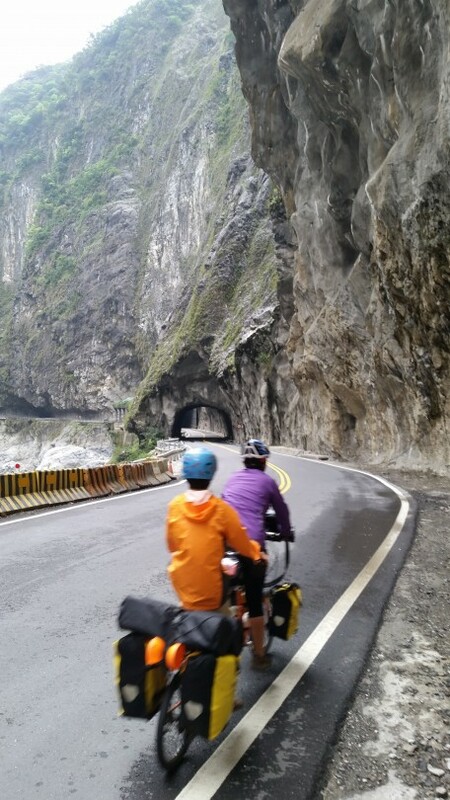 Firstly, the only way not to backtrack was to ride over an almost 4km high mountain range and nobody was putting their hand up for that, especially with a fully laden tandem. Secondly, there is so much to see and do in the Tarako National Park and it is so much easier to do all the side trips when cycling down rather than up. 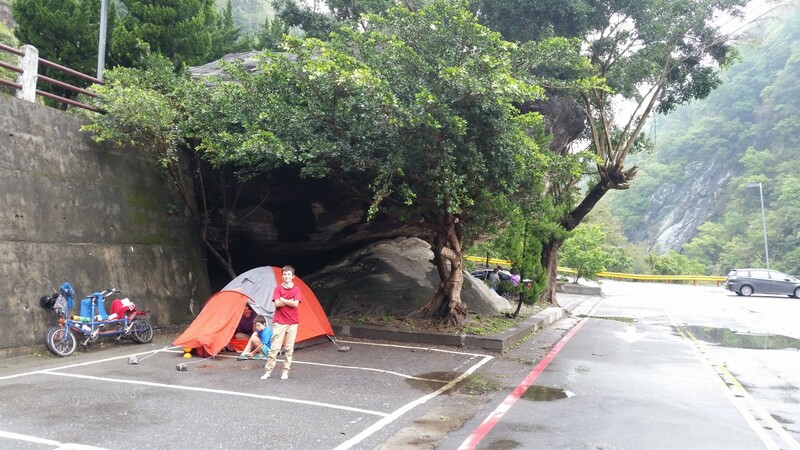 We camped in the Bai Yang Waterfall Trail carpark just northwest of Tienhsiang. It rained most of the night, but cleared at 7am. Considering it was a carpark in a gorge and it rained all night we had a good sleep. It was quiet and dark and other than a couple of rocks that reverberated up the gorge it was a good camping location. 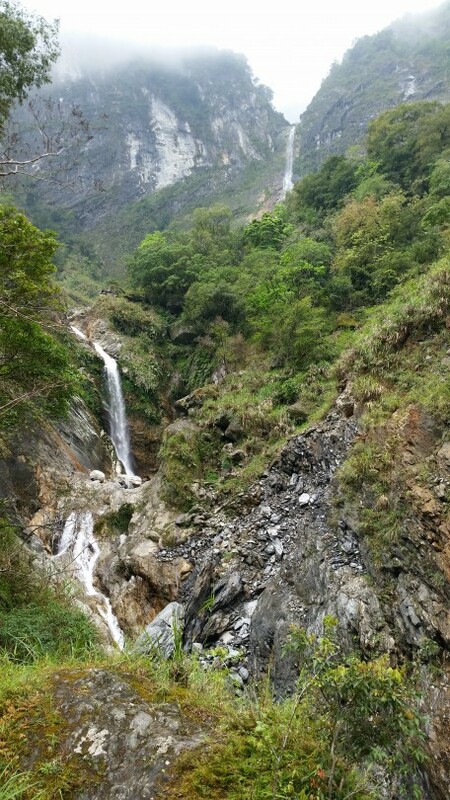 We started the day with a walk to the Bai Yang Waterfall. It is a short walk from the carpark to the start of the trail. It is an odd start to a walking trail. 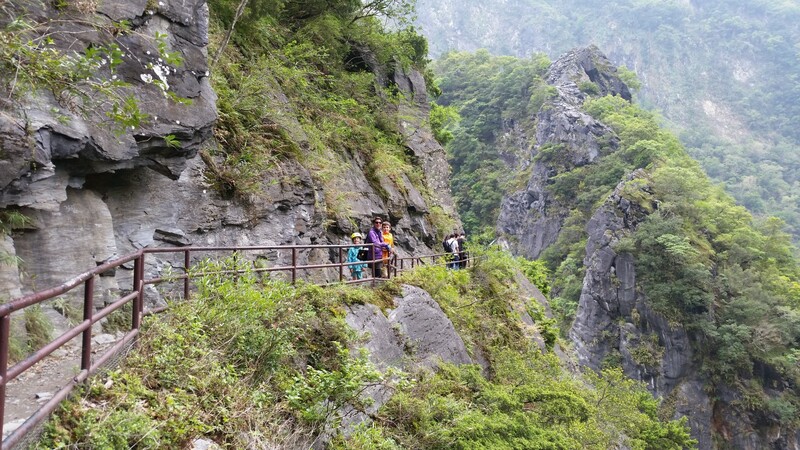 It begins via a 380m tunnel that goes into the gorge wall beside the highway and there is no pedestrian path from the car park so you have to walk on the highway. The light in the photo below is the exit at the other end of the tunnel. 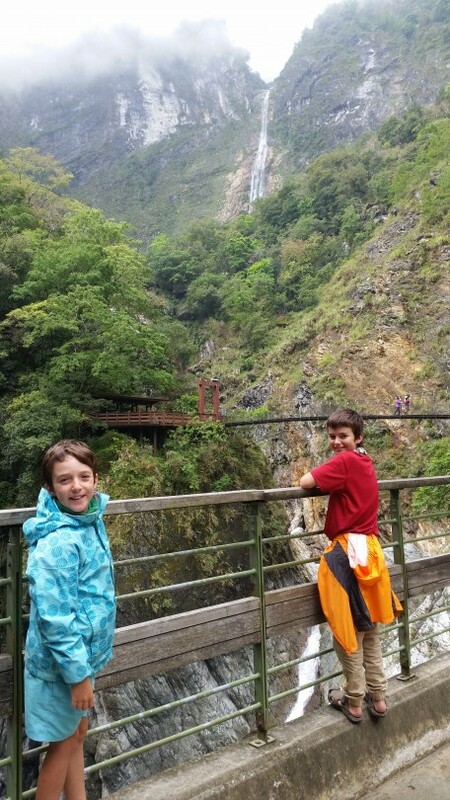 After a 2km walk through tunnels and beside a clear stream gorge we make it to the waterfall. After the waterfall we pack up and head into Tienhsiang for lunch. 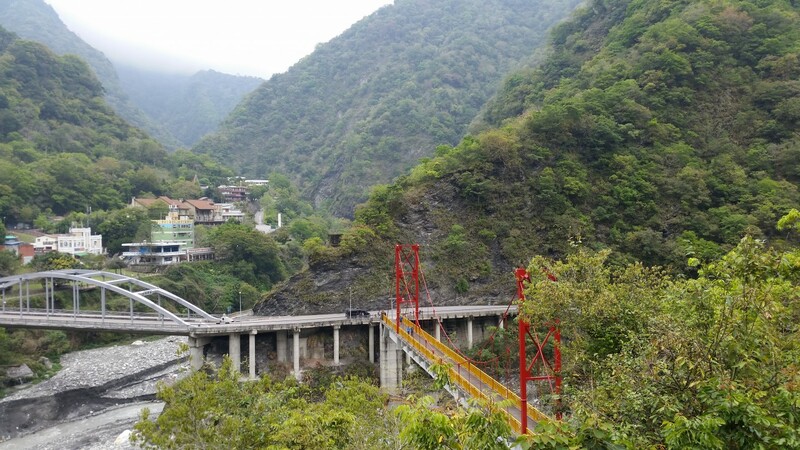 The photo below is taken from the temple overlooking Tienhsiang. If you look closely Julie and the boys can be seen standing near the red pillars in the centre of the photo. After a short ride we come across another scenic trail. 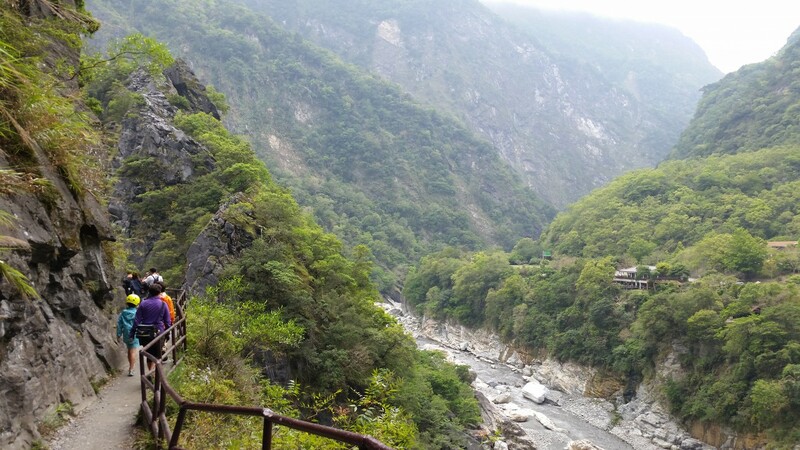 It is the Lushui-Heliu Trail that follows some of the track originally built by the Japanese over 100 years ago to conquer the Taroko tribes. The tribes had resisted the Japanese colonisation for over 20 years because it was such difficult terrain to traverse. 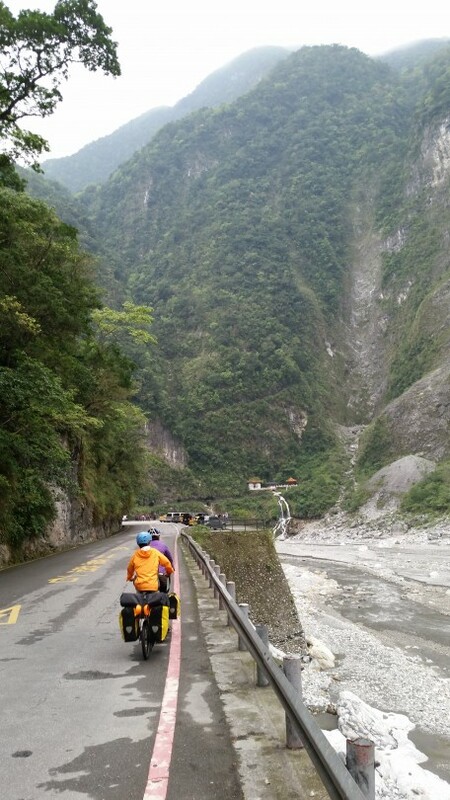 The ride down the rest of the gorge is fast but a little harrowing. The speed limit is supposed to be 40kph, but some vehicles, including buses, seem to think that it is a grand prix circuit with all the chicanes and don’t want to slow down. We had a few close calls, but luckily the roads weren’t too busy and most drivers were good. 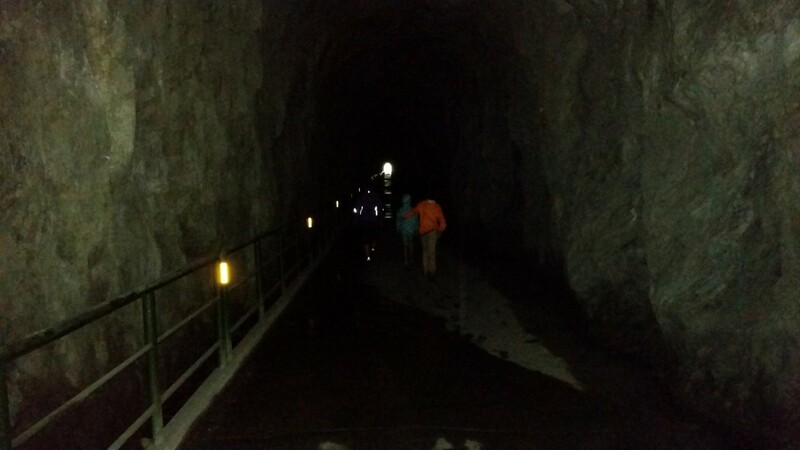 However, in the tunnels and cut ins there is no where to hide, so we didn’t loiter. 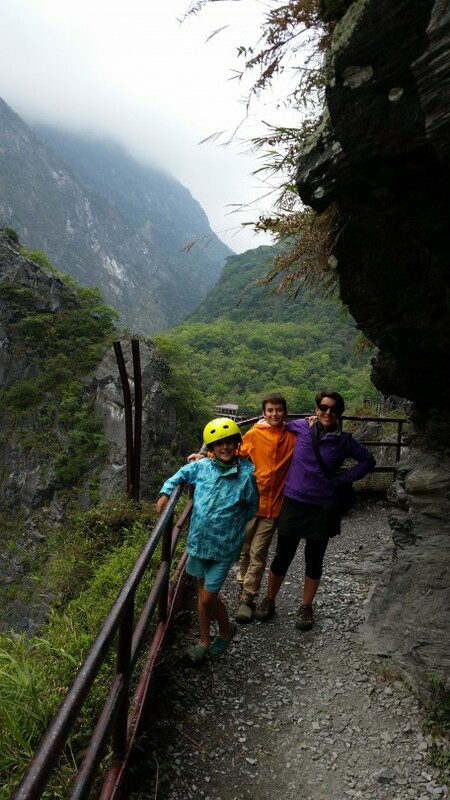 Previous PostDay 79 – Xincheng to Tienhsiang in Taroko NPNext Postwe found gold! 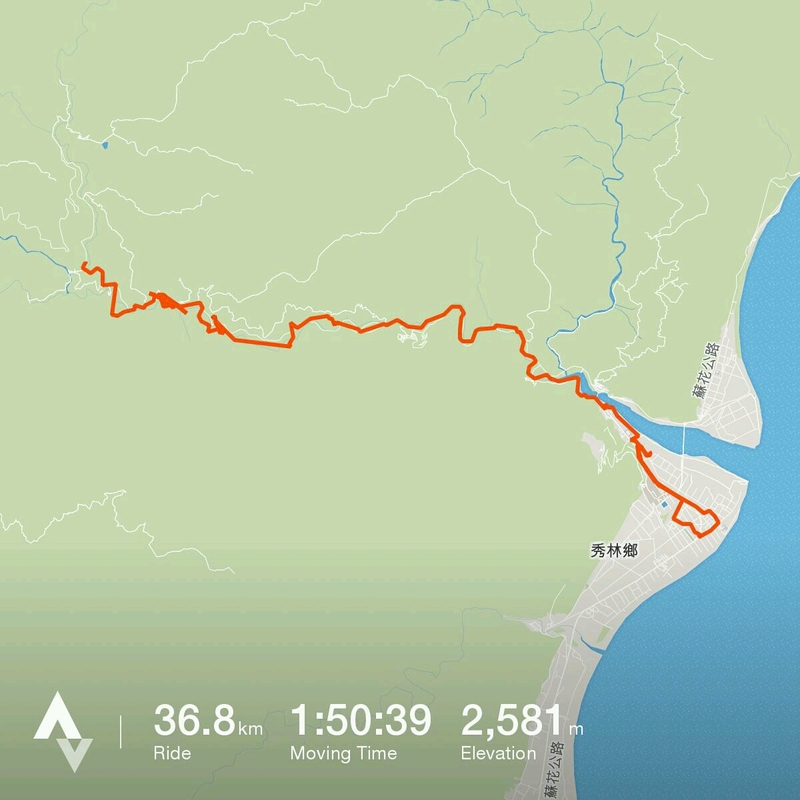 Hey once again amazing and exciting rides, waterfalls and roads. Keep safe. BBQ here again tonight. Cold Easter so far.